One year ago Darrell "Bubba" Wallace Jr, became the first African American man to win a NASCAR race on any pro (nationl), level in 50 years (since the late Wendell Scott), at the fall Martinsville race. Today he won that race again. The significance isn't just that he won that race again or that he is in third place for the championship (only 22 points behind defending champion Matt Crafton), its that Martinsville was the home track for Wendell Scott (29 miles from his home in Danville, VA), and as tribute Bubba drove a tribute truck for Wendell Scott with his number on (# 34 instead of Bubba's usual # 54), who will be inducted into NASCAR's hall of fame on January 30, 2015 in Charlotte North Carolina. Last year in victory lane (winner's circle), at the Martinsville race, the historical significance wasn't lost on Bubba who was emotional and mentioned Wendell at his first national win. Today's win was Bubba's race, he qualified on the pole yesterday (96.22 miles per hour), to start the race at the front and though he had to battle through the tight turns at Martinsville and a lot of physical racing with many lead changes, a few wrecks and hot tempers, Bubba prevalied to finish the race as he started in first. But Bubba isn't the only NASCAR driver honoring Wendell Scott, Sprint Cup driver David Ragan will also drive a tribute car (though is usual number is 34), still his paint will honor the soon to be Hall of Famer. David was the first to get the # 34 car back into victory lane last season at Talledega since Wendell's historic win in Jacksonville, FL back in December 1963. 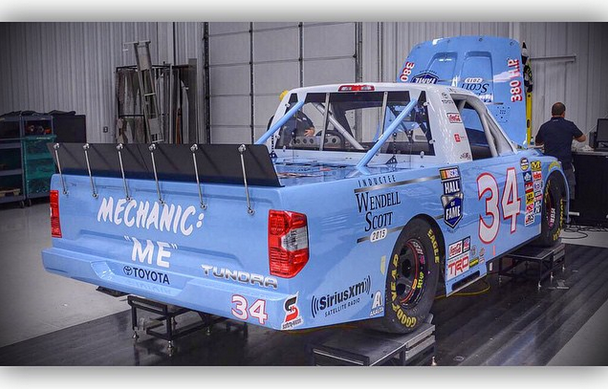 Wendell Scott's story of perseverance in 12 seasons of professional stock car racing (1961-1973), resonates with all drivers, including David who knows what it means to struggle and win. And though Wendell only had that sole win and Bubba now has four, it was Wendell who made 495 starts in his time and finished in the top five 20 times and finished in the top 10 147 times. Bubba shows the same consistency this year and got his second win earlier this year at Gateway Motorsports Park outside of St Louis and his third win on the dirt track in Eldora, OH at the Mudsummer's Night race. Bubba has 11 top ten finishes, 8 top finishes and that is out of 19 races just for this season. He has also lead laps in 9 of those 19 races and has started in the top 15 of every race this season except three and two of his races (including this past one), Bubba started on the pole. All of this in the Camping World Truck Series and he just turned 21 on October 8th. There has a been a lot of talk of Bubba moving up to the Nationwide Series (only the Sprint Cup is ahead of that), on a full time basis. He has raced two Nationwide races this year, starting in the top 10 in both of them (the fabled tracks at Daytona & Talledega), and getting a top 10 finish at the Fourth of July race in Daytona. Bubba also race in four Nationwide races in the 2012 season, all top 20 starts and all top 12 finishes and from there he was full time in the Camping World Truck Series where he had 11 top ten finishes and five top 5 finishes out of 22 races. So the future is bright for Bubba because is he a solid racer, with the right mix of aggressive tactics, patience, skill and knowledge of the sport and history and oh yeah, he's fast too.